Two years ago, Remington Trueblood left England and everything he held dear, all for the chance at a new life. 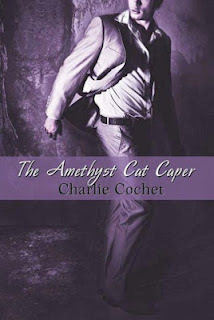 Now the successful owner of The Purple Rose Tea House in Manhattan, Remi has come across the perfect addition to his business: a stunning amethyst cat. But Remi's acquired something else with his latest purchase: the attention of the notorious Gentleman Thief! Detective Stanley Hawk doesn't know the first thing about tea. He's strictly a java kind of guy. What he does know, is crime, and someone's just committed one. As a Pinkerton’s, Hawk always gets his man, and when his investigations lead him straight to Remi, never have truer words been spoken. Can Remi and Hawk resist each other long enough to figure out who the thief is and what the heck is going on? Or will the Gentleman Thief get his hands on more than just the Amethyst Cat? From a quirky antique shop, to a high-society tea house, The Amethyst Cat Caper is a delightful romp through 1930s New York. Whether you prefer tasty tea or steamy java, grab yourself a cuppa and enjoy! Anyone who ever dreamed of slashing Sam Spade would feel right at home with Charlie Cochet’s detective romance. Set in 1934, this novella has the gritty feel of the ‘30s, where a country still mired in the Depression remembers the high life. A priceless antiquity stolen by the Gentleman Thief ends up in a curiosity shop, taken for a counterfeited gew-gaw and sold to an expatriate Englishman. What looked to be a pretty bauble is suddenly sought after by everyone from Pinkerton’s agents to foreign government inspectors, and hapless purchaser Remington Trueblood is on the run. The Gentleman Thief wants his prize back, and if he can steal a little more in the bargain, he’d take it. Detective Stanley Hawk, the Pinkerton agent, finds himself falling for Remi in the course of protecting him and the amethyst statue, and Remi’s surprising himself by behaving so seductively toward the man. What follows is a head-spinningly rapid bonding, fast even considering the fast-forward effects of danger. Hawk is the more complicated character of the two: hints of his past crop up to tease us with wondering what his story is and how he came to be part of a private law enforcement agency. He’s at peace with his sexuality, guarding himself for safety’s sake more than propriety. He’s willing to take what Remi offers, and is surprised only that the offer includes his heart. Remi’s story is more conventional, a break with his family for being unable to satisfy a cold father’s unrealistic expectations. He’s come to New York to seek his fortune, and in only three years, he’s managed to make a name, a place, and a success of himself. This part seemed a little odd, in that he would have begun during some really grim times. He grieves his old life, and especially the loss of his youngest brother, who cannot so much as receive Remi’s letters. Remi has loved before and been burned, making it easy to see how he can blow hot and cold about falling for the detective. The story has a nice period feeling; the slang has the right flavor for the times. The noire atmosphere, with danger, double-crossing, and love comes across well, though I could have done with fewer endearments of “baby.” A few aspects of Remi’s background didn’t seem quite accurate (did anyone study business at Cambridge in those days? ) but were a minor bobble in the greater story. Even with the extreme speed here, the relationship unfolded with the adventure. The identity of the Gentleman Thief was evident far too early, a mystery is usually improved with a red herring or two, so the mystery then shifted to why and how, rather than who.